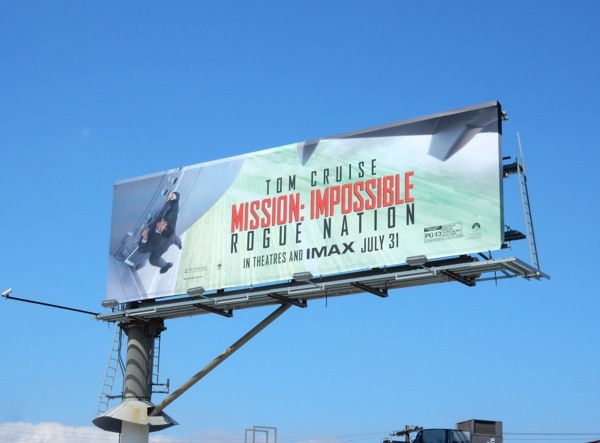 Some sequels this Summer have failed to deliver, Ted 2, Terminator Genisys and Magic Mike XXL come to mind, so can this international espionage film franchise deliver with its fifth installment, Mission: Impossible - Rogue Nation. 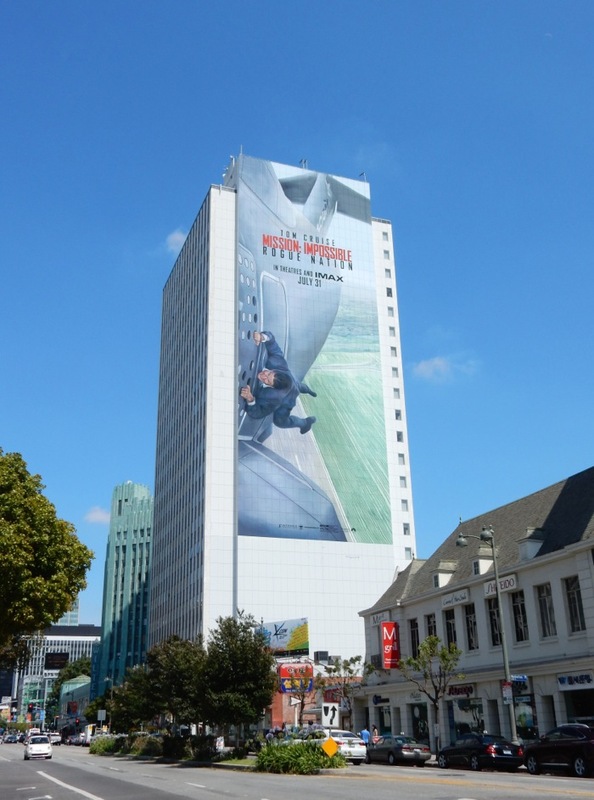 After intriguing television viewers for seven seasons from 1966 to 1973, the IMF (Impossible Missions Force) team first exploded onto the big screen in 1996 with Tom Cruise starring as 'Ethan Hunt'. 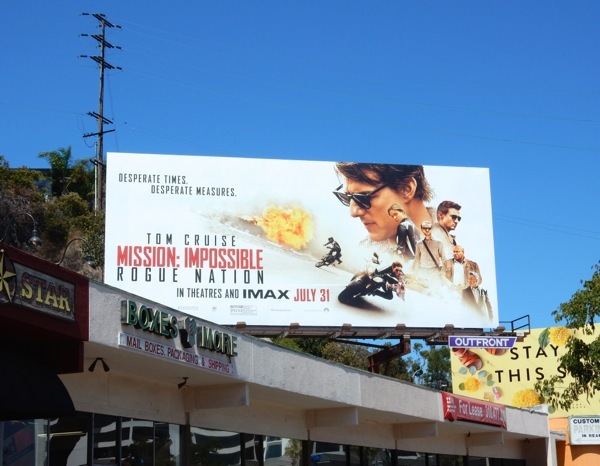 Now he's back for a fourth sequel with some familiar faces (Simon Pegg, Ving Rhames and Jeremy Renner) and new ones (Rebecca Ferguson) and going rogue, as desperate times call for desperate measures. 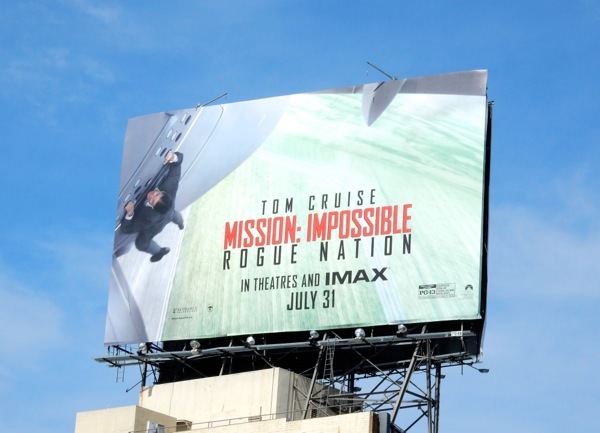 But in Mission: Impossible 5 they may just have met their match, as a new sinister global Syndicate sets the IMF in their crosshairs for extermination. 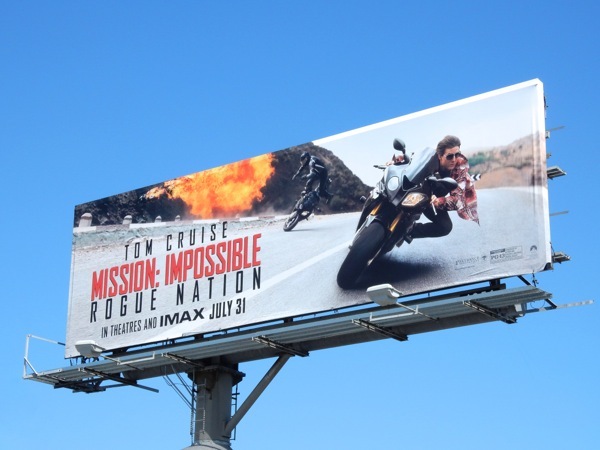 Frequent Tom Cruise collaborator, Christopher McQuarrie, directs this latest spy thriller, and as you can see from all these different ad creatives for the movie, expect the usual mix of explosions, gadgets, action and death-defying stunts. 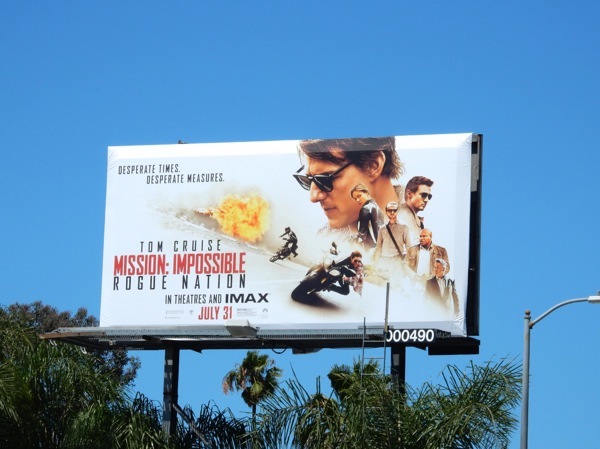 These Mission: Impossible - Ghost Protocol billboards were snapped making a spectacle in the skies of L.A. from July 2 to July 11, 2015. 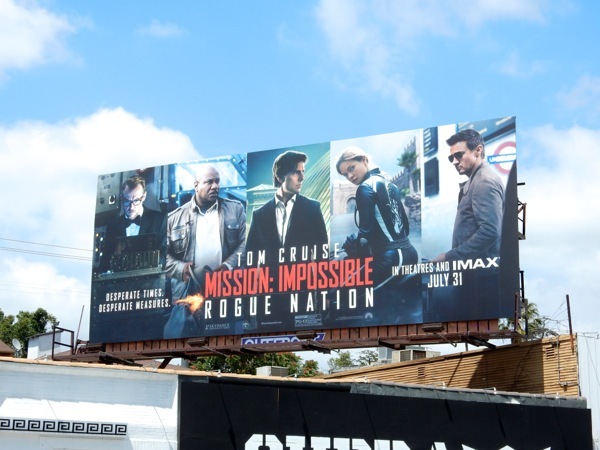 If you're a fan of the movies, be sure to also check out all these fantastic billboards for Mission: Impossible: Ghost Protocol from 2011, plus you should also check out these original costumes from the Mission: Impossible movies. 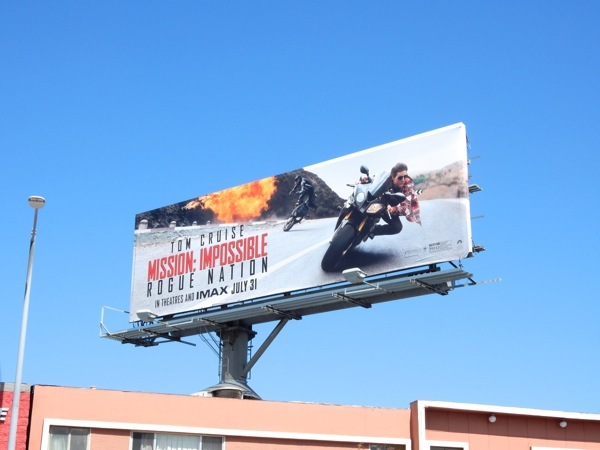 Obviously everyone at Paramount Pictures hopes that this action-packed sequel will do the same business as sequels like Jurassic World, Minions and Avengers: Age of Ultron have already done this year, so let's see if Tom Cruise can still deliver at the box office. 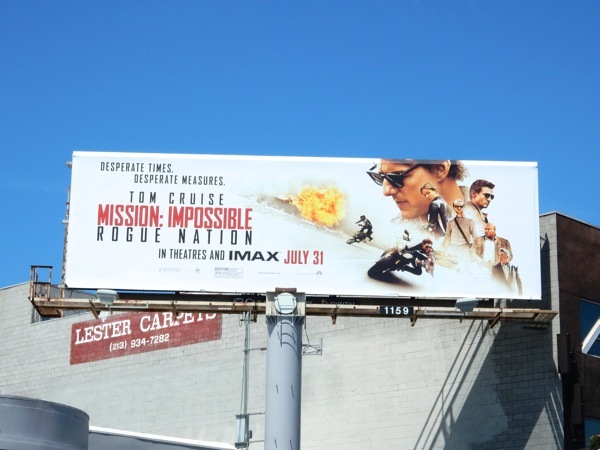 This post will self-destruct in five seconds if you don't like, tweet, tumble, pin, +1 or share this page. 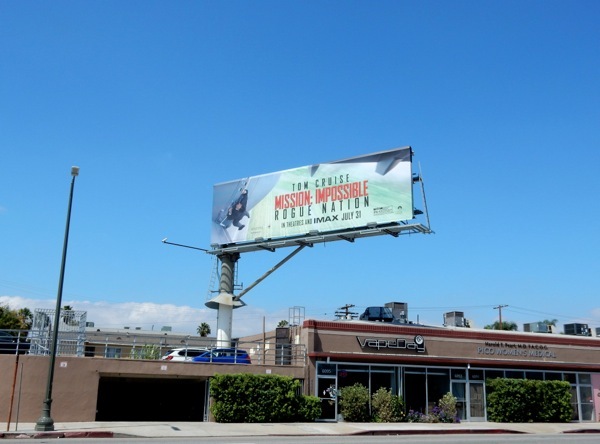 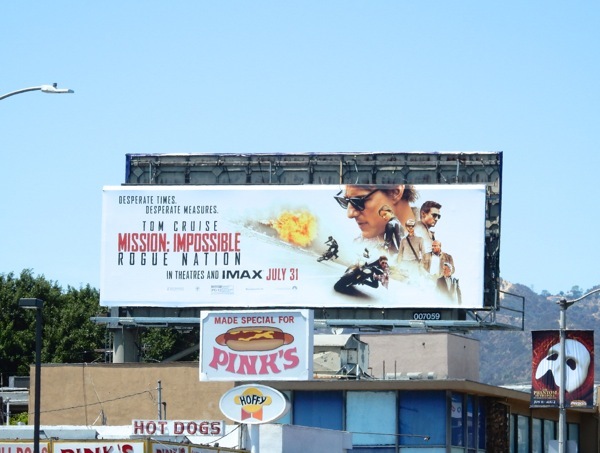 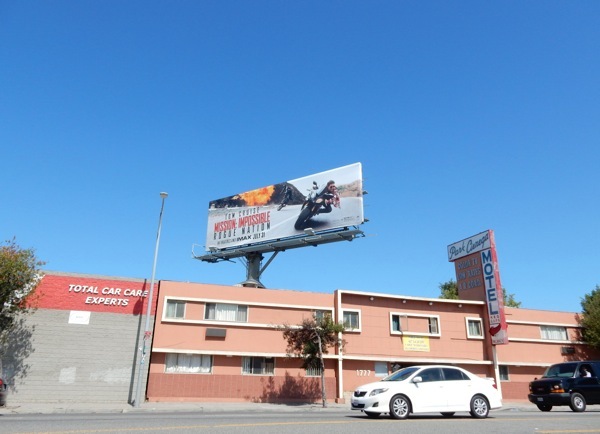 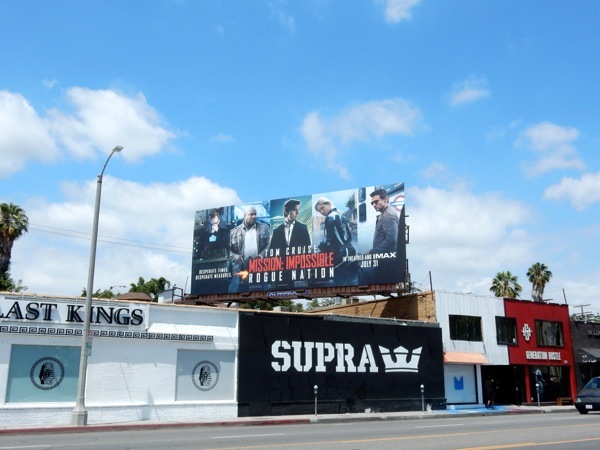 UPDATED: Here's another prominent billboard for the movie snapped along the super-busy Sunset Strip on July 17, 2015. 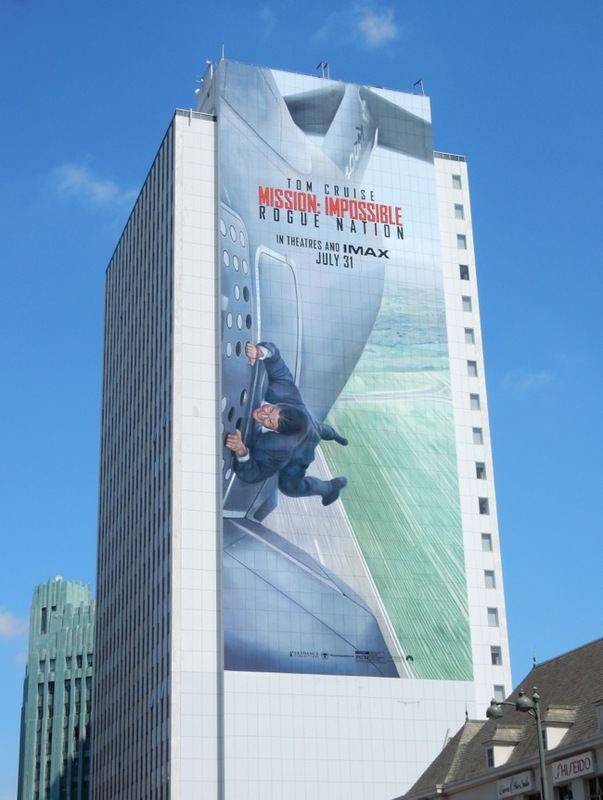 Plus here's a super-sized version of the creative with Tom Cruise clinging to the outside of an Airbus A400M, and apparently that's really the 52-year-old actor and not a stunt double. 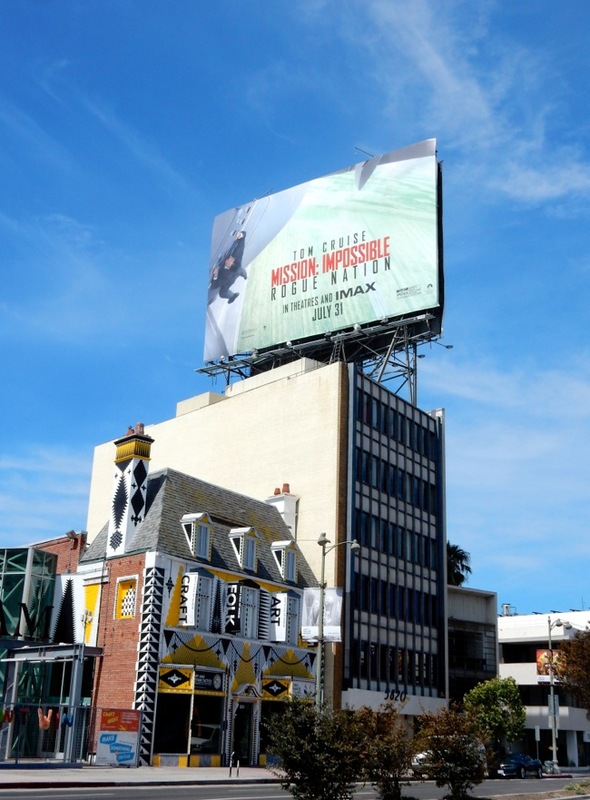 This spectacular billboard was snapped along Wilshire Boulevard in Koreatown on July 21, 2015, and let's face it, it wouldn't be Mission: Impossible without Ethan Hunt scaling some impossibly tall building, dangling from a wire, or some other action-packed stunt.